Yay! Gorgeous! Also, I'm kind of relieved to see that you used chalk for your quilting lines. I thought "you people" did that kind of stuff naturally :). It's beautiful! What a lucky kiddo. And that must be a great feeling, to get this FO off your back! YAY DONE!! :) i haven't finished a quilt in....forEVAH. wow. it's absolutely gorgeous! 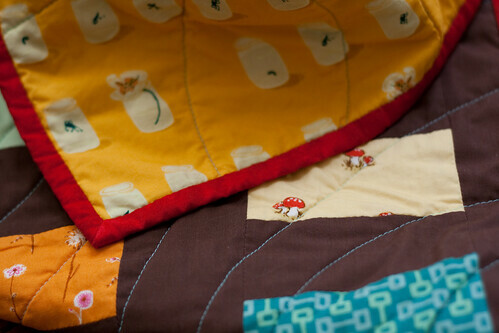 i want to learn how to quilt so badly now. I remember you working on the quilt way back when. Hurray for finishing! It looks beautiful. Great colors. It's beautiful! I always do my bindings that way. In fact, my joy of handsewing the binding is what made me realize that I'd love knitting. What a gorgeous quilt. Sometimes waiting to finish a quilt (even if its year's later) is totally worth it! I love that pattern, I have had my pieces cut out since last summer for a queen quilt, but haven't sewn a one. 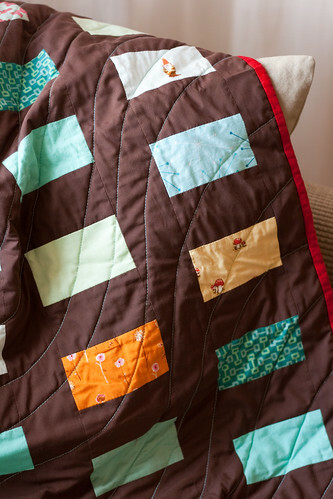 Love the quilt lines. 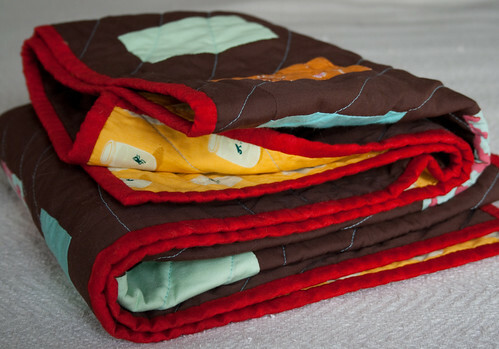 Coin stack quilts seem to be so popular lately. I love yours. I love your choice of fabrics, brown and blue is so delectable. Congratulations on finishing it up after all that time! it looks so so so awesome!!!!! Beautiful! I love the wavy quilt lines. Great job! I love the soft waves and the colors. Love the colors, beautiful quilt! Wow, that is fabulous! 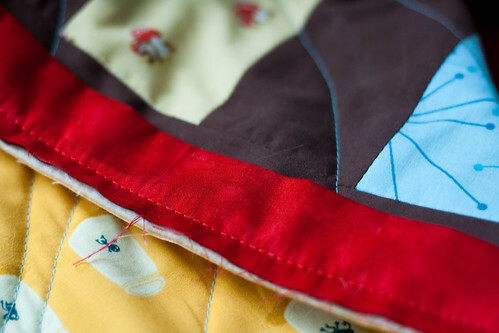 I LOVE the undulating quilting lines! Love it!!! The curves are really cool! That quilt looks awesome! Must remember it when I have to make a quilt with novelty fabrics. So cute. Makes me want to cuddle up in a quilt. What an amazing quilt! I adore it. 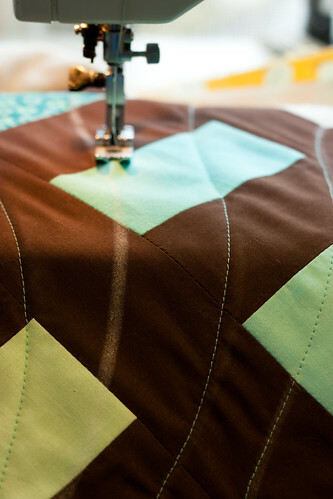 The quilting lines are really neat. It's lovely! 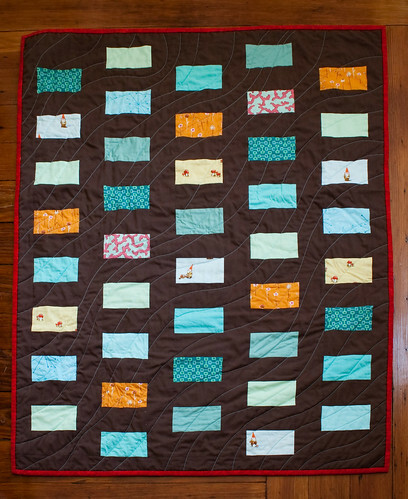 I love your quilting waves, and the color choices! So pretty! Really tempts me to have to make one of my own! :) Thanks for the inspiration! I really like the wavy quilting pattern. Your quilt turned out to be lovely!